My old blender has been getting a work out! 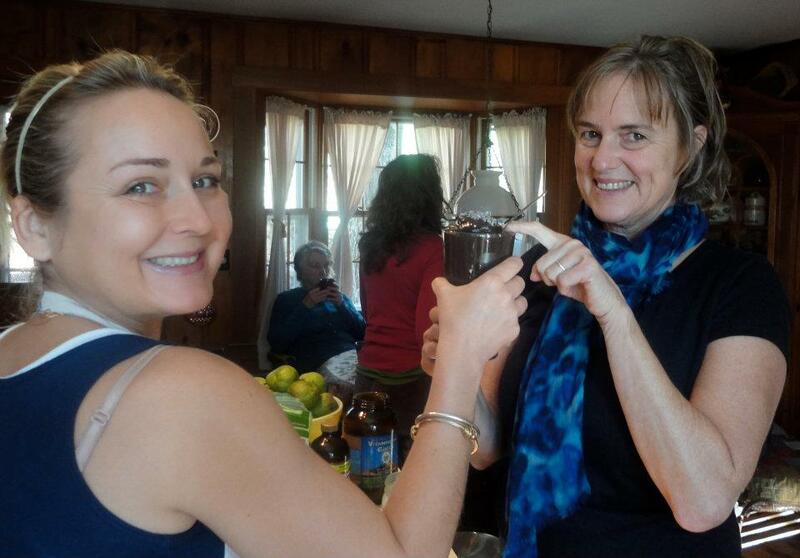 I attended a Raw Food Yoga Retreat at Sunny Slope Farm in Alton, NH with Fae Kontje-Gibbs and Stacy Stowers. I have been harvesting the mustard greens and miners lettuce. I have been using the idea of Stacy's Happy Shake to make my own variations and they have all been good. Today, I had miner's lettuce with 1 tomatillo, 1/2 a pear, 1/2 a banana and raspberries, vitagreen powder and maca powder. Miner's lettuce is one of the few salad greens that is indigenous to North America. It grows in cold weather and is perfect for a cold frame. I've also been using mizuna in savory shakes with tomato. The greenhouse has both of these nutritious greens for the picking. I have also been making another specialty of Stacy's , Winter Squash Soup. This soup is not raw, but it is heart warming and very nutritious. But the best part is that is is very easy. Yes, easy!! My husband loves this soup and it has no meat. Just cut up the squash skin included but no seeds. Put it in a soup pot with an onion, and cover with water. Cook until tender. Now the fun part, you can throw in broccoli stalks, and other vegetable trimmings. You can throwing in seasonings like a little hot pepper, pumpkin pie spice, or cutting celery. I put in a dried Jimmy Nardello Pepper, parsley, and some cutting celery in this batch. (There is cutting celery in the back garden.) Then put in 1/3 cup of nutritional yeast. You can buy this in bulk at Cronigs, so try a little. I admit I was sceptical, but now I am a believer. Nutritional yeast is a great addition to the diet of vegetarians as it is high in protein and B vitamins. Reliable Market has had winter squash at a great price, including kabocha and buttercup. The last step in this amazing soup is to blend it with an imersion blender. I love my new toy. It came from Le Roux and was the same price online with no shipping. So get to the greenhouse, enjoy the sun and warmth and pick up some greens for salads, stirfries, and maybe a smoothie! We will miss you Chuck! The greenhouse is getting a new film covering. This will allow a lot more light to reach the plants and help productivity. A crew is meeting this Saturday at 8:30. If you can come help, bring cordless power tools and staplers. There will be chili and soup as well as other goodies. There are many things growing at the greenhouse. Lettuce, mustard greens, spinach, pak choi, kale, arugula, broccoli raab, and swiss chard are all in the beds. We have had a difficult time getting the seedlings going because we have a mouse! or two! The mouse is digging up the seeds we have planted and replacing them with melon seeds. If only we could train it! We are using plastic covers to help protect the seedlings. We have been picking the baby arugula and mizuna and the lettuce will soon need thinning. We have a new manager, Chris and he has been working with us Wednesday and Thursday mornings between 9 and 12 AM. We have had a steady crew of workers over the last two months.